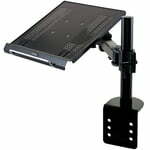 This bracket is for mounting on your desktop, providing adequate space for your notebook. The platform can be mounted at different heights and the holder can be pulled out up to 57 cm. An additional pull-out keyboard holder allows the use of an external keyboard. The aluminum construction of the platform supports the cooling of the notebook.